Not sure if you can tell, but I was tremendously unhappy when I took these photos. Just a few hours earlier my dog chewed up my passport. That's right -- my passport. I was at the gym releasing endorphins and came home to see my face all torn up on the carpet. No amount of endorphins could make me feel better. But I still had plans to take these photos, so I had to grin and bear it. And since this lovely dress by Fevrie is called the Audrey, I decided to put on my funny face, like Ms. Hepburn, herself. But the hubs did make me feel a bit better with a milkshake. Carbs tend to do the trick. What is your pick-me-up when something terrible, awful happens? Is it coffee? Chocolate? Wine? A run? Music? A good cry? love your floral dress and the print mix is perfect. I always go for a good run or yoga when something not so pleasant happen to me. You didn't look unhappy at all and I am in love with your shoes and dress!! Ugh sorry about your passport! If only milkshakes could bring all the passports back to the yard :( I've been heading straight to junk food when I've been feeling bad lately - I should probably cut back on that haha. Beautiful dress! Those shoes are AMAZING!!! Great find Cheryl! So sorry to hear about your passport Cheryl :( Well your disappointment doesn't show here and that is one chic mix of patterns. Listening to music and having some chocolate usually cheers me up. Awww...no, that's not nice...:-). I'm sure your dog felt sorry afterwards. The floral dress is pretty and goes well with the shoes. Have a great week. Dog eating your passport? Yes, that would surely be worthy a glass of wine + good music! Love the dress. Awww, I would have been upset too. Chocolate is my favorite pick me up. It always makes me feel better. On a fashion note, I love your dress and shoes. Ugh, what a pain in the rear! I'm glad you powered through, though. This outfit is fantastic. I love the mixed prints. And those shoes! the look is fantastic, sorry for the unpleasant surprise. Such a great dress and with those shoes-hello fierce! Your Audrey Dress is beautiful and you look fabulous wearing it. I can't even imagine how upset you must have felt upon discovering the dog-chewed bits of your passport torn up on the carpet. Even though I've never had a passport I know I would feel stressed at having to get a new one. My pick-me-up when something awful happens? Eating too much ice cream while watching a combination action movies followed by really dumb comedies. 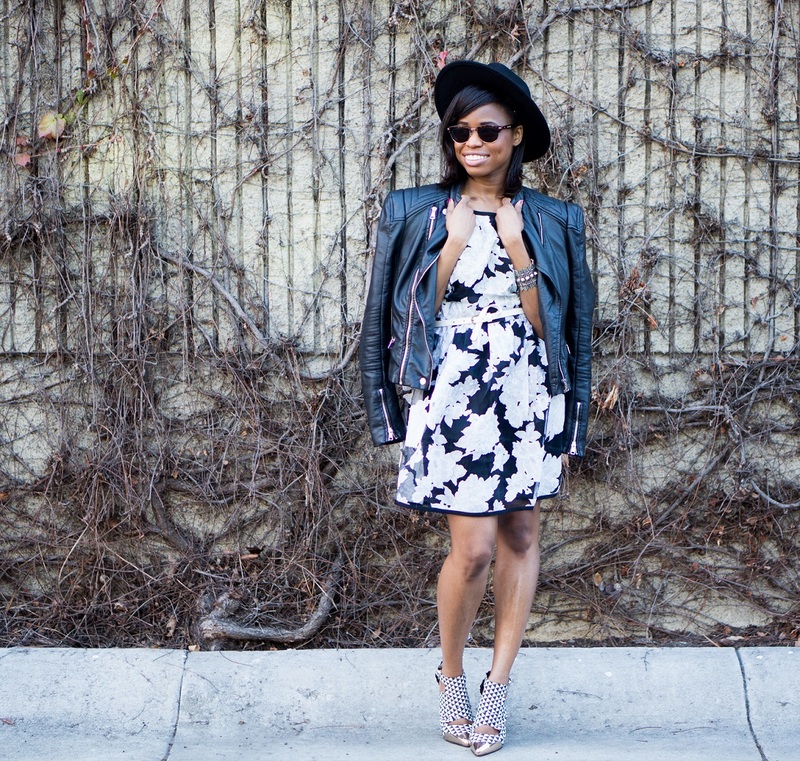 Love how you styled this pretty little dress with the hat and leather jacket! Such a fresh take on a feminine floral dress! Aww, bummer! Glad you didn't let the incident ruin your outfit shoot though! You look great! When something bad happens I will sometimes go online to distract myself. YouTube videos work well. love your dress with those heels! ooh noo!! So sorry to hear that Cheryl. A milkshake sounds like the perfect solution. Also, I really have a thing for frozen (then baked) cookies. I can make cookies at home just fine, but the chewiness of the premade kind just can't be beat. Love your outfit - the shoes, the dress! Perfect. I love this outfit on you and those shooze. . . . .
that dress and hat go perfectly together! love it Cheryl!